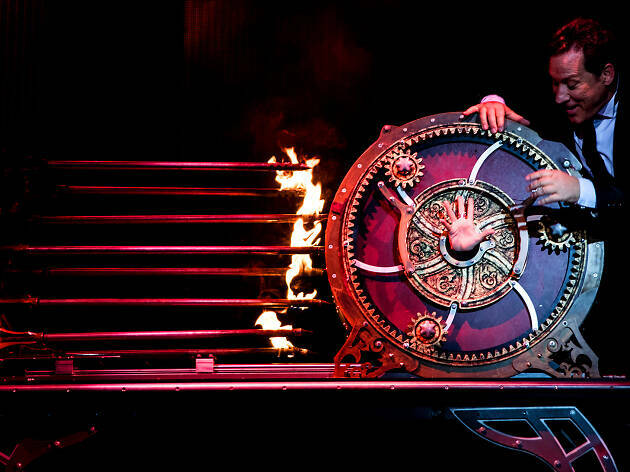 If the test of a good magic show is the number of times an audience gasps and wonders, “How the hell did they do that?”, then the latest iteration of The Illusionists should be a hit. It mightn’t be the classiest night you’ll ever spend at the theatre, but there’s plenty of fun to be had if you take a few kids (or a few drinks) with you. It’s now an annual tradition that producers Tim Lawson and Simon Painter bring a Vegas-style spectacular to the Opera House each summer, and there have been a number of different versions, including The Illusionists 2.0 (2014) and The Illusionists 1903 (2015). They’ve travelled extensively and had successful seasons in London and on Broadway. This one is very much back to basics: a rotating roster of magic acts ranging from large-scale illusion to sleight-of-hand, up-close magic (although given the size of the Opera House’s Concert Hall, you might hope for a few more large-scale moments of spectacle). And it is a great line-up with hugely impressive illusionists and well-practiced, sharp entertainers. The host is Jeff Hobson, aka “the Trickster” (The Illusionists franchise gives each of their stars a lofty nickname), who delivers a masterclass in old school, camp American showbiz comedy. He knows how to respond to whatever might be happening in the audience at any particular performance, which is part of what keeps this show feeling alive and fresh, despite the fact that these illusions have probably been performed hundreds if not thousands of times. There’s also Kevin James, aka “the Inventor”, who’s known as one of the magic world’s most prolific illusion inventors, and has crafted acts for Penn and Teller, and David Copperfield. He performs a number of illusions here, including the charming close-up “floating rose” illusion that he created for Copperfield. He also performs a bit using a chainsaw and dismembered assistant that proved a winner with the opening night audience. Double act Mark Kalin and Jinger Leigh, aka “the Showman” and “the Conjuress”, perform two thrilling disappearing/reappearing acts, and Jonathan Goodwin, aka “the Daredevil”, performs a brilliant act involving handcuffs and a live scorpion, and another more spectacular escape involving a straitjacket and a hell of a lot of lighter fluid. But the two most memorable bits come from Chris Cox, aka “the Mentalist”, whose mass mind-reading acts are as funny as they are jaw-dropping, and An Halim, aka “the Manipulator”, who seems to conjure up hundreds upon hundreds of playing cards out of thin air. Of course, there’s more craft to this sort of show than just the technical side of things; it needs to be a well-paced, effective night of entertainment with appropriate dashes of comedy. It’s not always entirely on point in this regard, and feels one big finale shy of a full deck. But when you’ve been so consistently fooled and bamboozled by illusionists with this much skill, it’d be difficult to feel you haven’t got your money’s worth. Go go go! So awesome, fun, thrilling and exciting for young and old. 5 stars and world class.